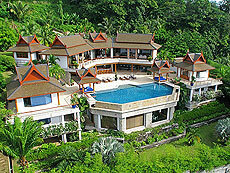 Villa Rak Tawan is a luxury rental villa nestled on a hilltop at west coast of Surin Beach. The villa features a 16 meter long infinity edge pool with panoramic ocean view of Andaman sea and spread over with 6 bedrooms. The villa could open from 1 to 6 bedroom by guest request. It is convenient for all visitors such as couple, family and group. There is surrounded by tropical green, but could get Surin beach about 2 minutes by car.